Thankfully, that wasn’t the end of the story. Years later – after saying it was on an indefinite hold – Capy surprised everyone by announcing the game’s imminent release. Within a week or so, we were sent a review code. 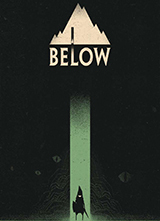 Finally, Below was available to play. It was only right that I’d jump right in and experience what I assumed would be a mystifying adventure game. For the most part, I was right. Below is an absolute slow burn with very deliberate pacing; it’s apparent that a lot of thought and love has gone into every aspect of the game. It starts with the camera zooming-in on a spec of light. As you draw closer, descending from the clouds, you’ll notice that spec of light is actually a boat in the middle of an inky black, shimming water. From there, the boat lands on a seemingly deserted island and you start. There is no hand holding. You have to figure out what to do next. This is, without a doubt, a gamer’s game. That’s not to say it isn’t accessible. Anyone can pick it up and play as they’ll eventually stumble upon the “correct” path. Things get tricky as the game progresses though. 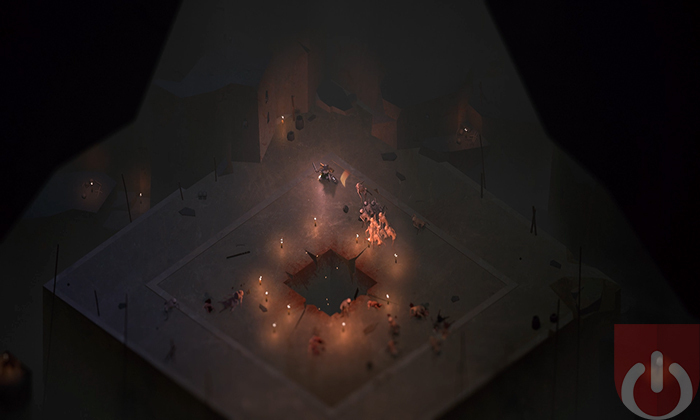 Below is a top down dungeon crawler with roguelike characteristics. The goal is to get to the bottom of every cave or cavern to unlock whatever’s at the bottom. There are hints here and there, that let on about the island’s mysteries. The point doesn’t seem to be in getting answers though; majority of the game is spent just trying to survive, which isn’t easy thanks to the game’s interesting set up. Your tiny explorer will need to eat, drink and stay warm. They’ll also need to fend off various creatures that lurk in the darkness while solving environmental puzzles. They’ll use multiple weapons, the most prevalent being a sword and shield combo. He or she will also utilize bows and arrows and other weapons, once found. As you explore the tunnels and caverns hidden underneath the island, you’ll collect items. The inventory has limited space, so you must figure out how to conserve or craft/combine certain items to make room. This can be anything from a torch to a crystal imbued with magical properties. These items are littered through the first few floors as you get used to the pacing but in later levels the items become harder to find. Enemies are presented in a similar fashion, with more and more mobs showing up the further down you go. The combat, at times, is reminiscent of early Zelda games. It’s way less forgiving though; I never could get the hang of the bow and arrows, so I mainly kept with the melee weapons. There are some instances where the bow is needed, however. That being said, I never felt I could accurately control it. My enemies made sure to take advantage of this fact. Some would land an attack or two, others would nearly kill me with a few swipes. 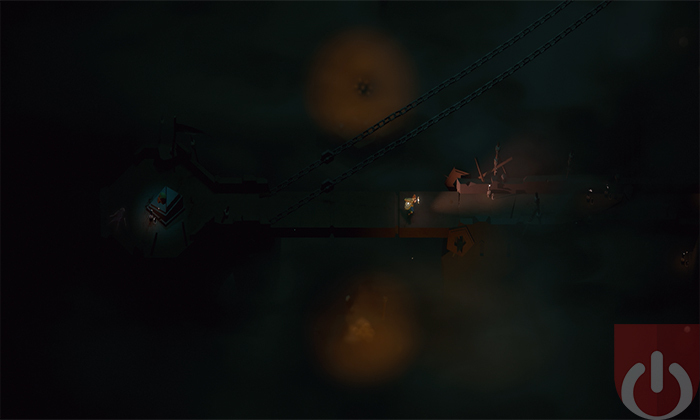 What really makes Below difficult is in how it seems to place you in unfair scenarios. This is due to the trial and error mechanics; remember, the game doesn’t hold your hand. Many times, the only clue you have that something should be avoided is a quick death. That’s when the rougelike elements kick in. Each explorer’s death is permanent. Meaning that you’ll control another character whenever the previous one expires. Because of this, when you die – unless you are lucky enough to have opened a shortcut – your replacement character will have to go and retrieve important items from the remains of their counterpart. This includes the magical lantern, an item needed to progress through certain floors. You can start to see the problem. If you die in a room full of monsters that you obviously couldn’t defend against the first time around, it’s an almost certainty you won’t be able to the second time. This is especially true if said monsters’ only weakness is an item the previous adventure was carrying; they aren’t going to wait for you to retrieve it from the body. 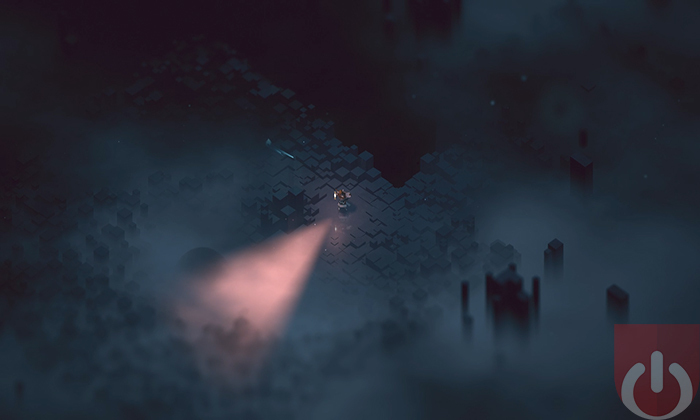 Making matters worse is Below’s procedurally generated caverns. Just getting back to your body can be troubling when the world shifts with each death. That doesn’t mean that the game is unfair – I said it seems that way for a reason. This is because each death is a lesson on what to do or not to do. After a while, it’ll become less about being lucky and more about using the skills you’ve learned through play. You’ll still struggle to manage your limited supplies which can become cumbersome at times. Losing health as you scrounge about looking for food and water can be a pain. And the enemies will become deadly over time; as you progress through, the latter half of the game just batters you down. At the same time, you’ll become more adapt at preparing for and dealing with these issues. Below, to me, is made to be consumed in 1-2 hour chunks at a time. This is not a game to rush through. It’s to be savored, bite by bite; I felt genuinely impressed with myself every time I discovered something new. If you do make it through to the end, the sequence is even better than the beginning. Even before then though, most of the magic is in the presentation and the process. The soundtrack helps with this, with Jim Guthrie’s shining throughout. Even though your character is small and nondescript, your surroundings are what make the game beautiful. There is a sort of minimalist cubism look to it, mostly dark with stark lighting strewn about for contrast. I wouldn’t recommend Below to everyone. It absolutely doesn’t have universal appeal. If you are looking for hand holding, move on. If you are expecting an easy laid-back journey into a mystical world, please pass. But, if you want an immersive and mysterious world where you can get lost and forget the worries of your life for a few hours, definitely check it out; I was overjoyed to find others in forums discovering things I’ve already found with the same excitement I had. Capybara has hidden so much in this world, you’ll continue to come back for more. Oh, and do yourself a favor and stay away from any FAQs, at least until you get absolutely stuck or after you’ve beaten the game. You won’t be sorry! 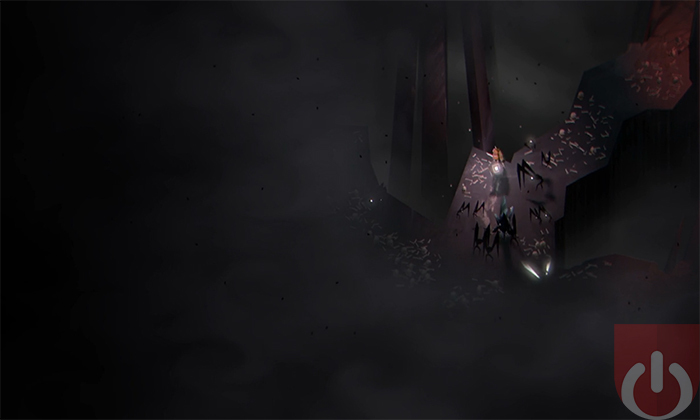 Below will be too difficult for some; its trial and error style gameplay can lead to frustration. Permadeath sometimes hampers the entertainment as well. Still, it does provide a rewarding experience for those who stick with it. Below's environments are as beautiful as they are engrossing. The art style is unique. The sound design and music are gripping and immersive. Definitely try headphones if you have them available. Below becomes more entertain the further you go. Those that stick it out will most likely want to return to learn all of it secrets.